Las Cruces was founded in 1848 on the site of a legendary Apache attack. Only one boy survived the massacre to tell the tale, and mourners erected a garden of crosses to commemorate the dead. 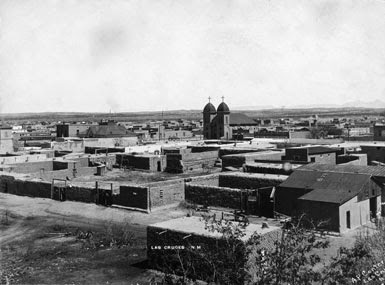 The new settlement adopted the name, "The City of Crosses," or simply Las Cruces. Birdie and I took a walking and driving tour of Las Cruces' historic districts. The first stop was at Holt House, built in 1907. The upstairs circular turret room was said to be Holt's poker room. 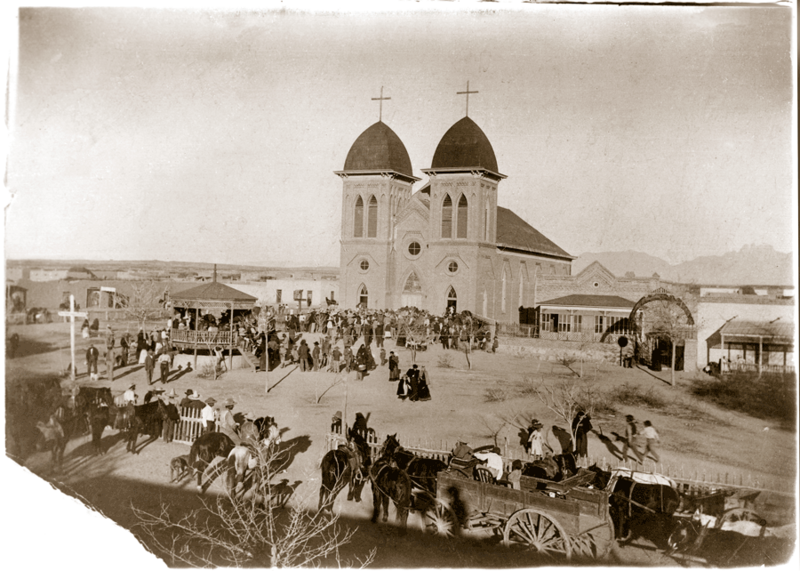 The Mission-Revival style architecture represents the talents of noted El Paso architect, Henry Trost, who designed over 800 buildings in the Southwest from 1900 to 1938. The Holt House is currently undergoing renovation. The Branigan Cultural Center was the first privately funded library, constructed during the Depression in 1935. Mrs. Alice Branigan willed the money to construct the Spanish-Pueblo style building in memory of her husband, a Civil War Veteran. Famed artist Tom Lea painted murals inside. This one depicts Franciscan fathers introducing books to the Indians. If you saw my post about nearby Mesilla, you read that they refused to allow the railroad to come through their town, so it came to Las Cruces. This was the first Depot, built in 1881. The Mission Revival style Depot replaced the original wooden depot in 1910. Today that building houses a railroad museum. 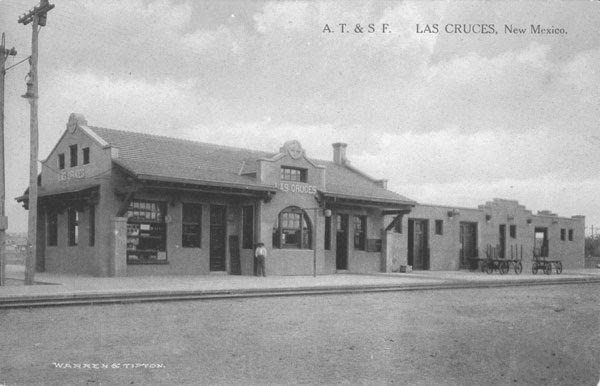 Las Cruces Avenue that led from the depot to the business district became the first paved road in town to give visitors a good first impression of Las Cruces. This mural on a building across from the depot depicts transportation history. As we walk from the depot toward town on Las Cruces Avenue, we pass Pioneer Women's Park. An active group of Las Cruces women joined together as the Woman's Improvement Association (W.I.A.) in 1894. As one of the oldest federated clubs in the southwest, the W.I.A. undertook many community projects, starting with the purchase of a hearse. They also bought a water sprinkling wagon to help keep the dusty, unpaved streets of Las Cruces under control. In 1898, the W.I.A. opened Women's Improvement Park, which they had developed using funds from hearse rentals, street sprinkling services, and ice cream socials. The park's pavilion became a popular meeting place for parties, speakers, and band concerts. The organization also built a clubhouse across from the park in 1927. Over the years, it has hosted activities such as citizenship classes, well-baby clinics, school dances, war relief efforts, weddings, square dances, and other community events. 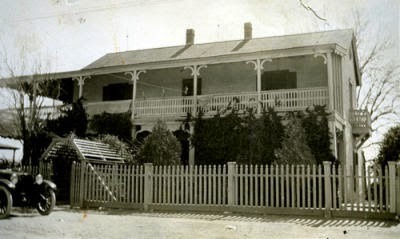 The Sam Bean house was built in 1892. Sam was the brother of the notorious "Judge" Roy Bean. 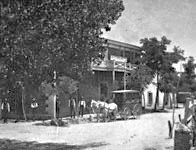 The brothers owned a saloon in Mesilla before the Civil War. Years later, Sam Bean and his son settled in Las Cruces. Prior to the construction of Elephant Butte Dam in 1916, this area suffered from periodic drought and disastrous floods. The Elephant Butte Irrigation District, housed in this building, expanded the canal and irrigation network, allowing for more efficient distribution of water and flood protection. Today the building houses a chapter of Alcoholics Anonymous. 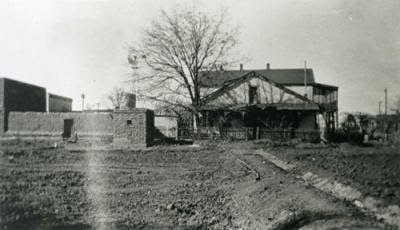 Las Cruces' first courthouse was torn down in 1937. And replaced by this Spanish Pueblo style courthouse. A local bond issue covered more than half the cost, a significant achievement in the height of the depression. The Amador House built in the early 1850s as a rooming house for travelers on the Chihuahua Trail. Billy the Kid is said to have been a guest here. The hotel was purchased by the county in 1986 and used for offices. It is now undergoing restoration and will be a museum when completed. Nestor Armijo, a prosperous freighter, rancher, and merchant bought this house in 1877, and began enlarging it. 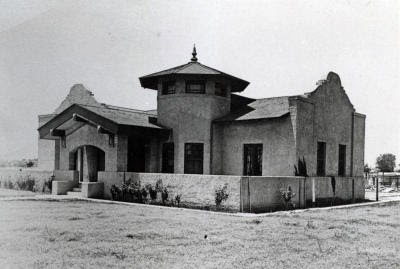 The house remodeling included two "firsts" for Las Cruces: a second story, and electricity. This house is also currently being restored. 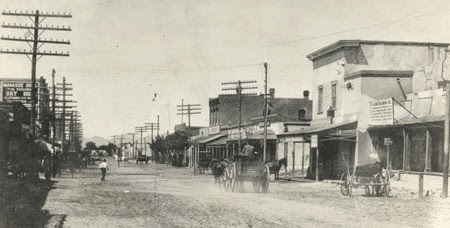 A peek at Main Street in 1905. Main Street today after Urban Renewal. Las Cruces showing the spires of St. Genevieves Catholic Church on Main Street. The building was demolished. This monument was erected on the old church site on Main Street in 1998. 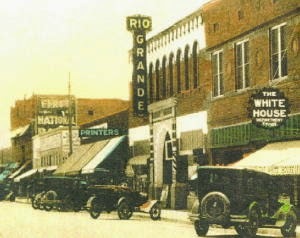 The Rio Grande Theatre opened on Main Street in 1926 with the showing of the silent film, "Mare Nostrum," accompanied by organ music. Southwest architect Otto Thorman created the look of the Rio Grande Theatre in the Italian Renaissance Revival style popular in the 1920s and 30s. It survived an earthquake in 1930, and a fire in 1933. The theatre closed in 1997 due to financial hardship, but was restored and reopened in 2005. 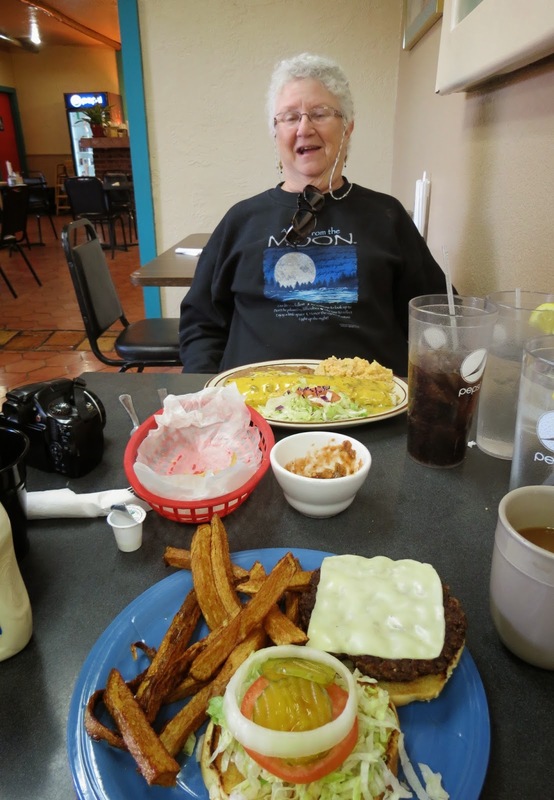 We decided to help out the downtown economy by having lunch at Rosie's Cafe. They have only been in business here for 2 weeks, but seem to be doing well. After lunch we resumed our tour in the oldest neighborhood ...the Mesquite Street Original Townsite. This old section of town is being restored, starting with this tiny park with beautiful tile murals depicting the town's history. Beginning in the early 1900s, the African-American population of Las Cruces grew to over 700. Since its construction in 1911, the Phillips Chapel served the community as a place of worship and as a part-time school during the segregated era from 1924-1954. This photo was taken before renovation. Phillips Chapel as it looks today after renovation. Most of the old neighborhood grocery stores closed with the rise of supermarkets, but this corner store survived and continues to serve the needs of the Mesquite neighborhood. That concluded our historic tour. This photo is of the modern City Hall. And Birdie and I thought this was a practical way to dual-purpose an array of solar panels. Mural on a water reservoir. Tomorrow we leave Las Cruces in search of other adventures. Love your comparisons of the old and new.